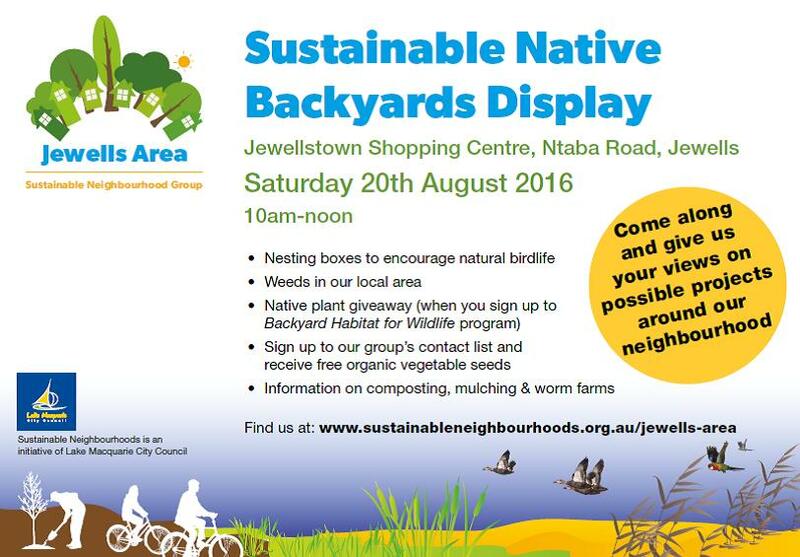 Join residents and friends of Jewells, Floraville and Belmont North to help make our neighbourhood more sustainable. We warmly welcome you to be part of this exciting new group. We are not currently meeting regularly, but are keen to hear about your project ideas and activities. Get in touch via JewellsAreaSNG@gmail.com or call 4921 0117. You can subscribe to our email list to hear about upcoming events and opportunities. Or feel free to drop us a line via JewellsAreaSNG@gmail.com. To kickstart Sustainable Neighbourhoods in the Jewells Area, all residents of Jewells, Floraville and Belmont North received the Sustainable Neighbourhood survey in the post in late February 2015. The survey provided an opportunity for residents to have a say about the things they feel are important in the community and identify ideas for community action. A community workshop was then held in May 2015. At the workshop some excellent results were achieved. Participants planned for the future by identifying local visions, values, and actions. Key areas of interest were preserving and protecting native plants, animals and green spaces, like Belmont Wetlands. The results of the survey and workshop have now been summarised and used to develop our draft Sustainable Neighbourhood Action Plan. We celebrated the completion of this process with a community event in August 2016. We created a display at the local shops to help peole learn all about creating backyards for habitat, biodiversity and sustainability.